HSC Swim Shop and is available the first and third Friday of each month at the pool from 6.30pm. Alternatively an order form with prices can be downloaded. Please speak to a committee member if you need any advice. As your child progresses through the squads they may need additional equipment e.g. float, pull buoy and fins. The coaches will advise you as and when these are required. The best place to purchase these items is from swim shop www.swimshop.co.uk. Prices vary depending on size required; Samples are available for children to try for size. All items can be personalised for an additional charge. These awards, developed in conjunction with the British Swimming Coaches and Teachers Association (BSCTA) can be achieved in competition. The awards are for each stroke at Sprint, Middle Distance and Long Distance level. You can achieve bronze, silver, gold and platinum for each stroke at each distance. Badges can be purchased at the pool from Joanne Cartwright and Helena Gee on the first and third Friday of each month between 7-8.30pm. Round badges (distance) are £3.50 and flash badges (stroke) are £2.00. 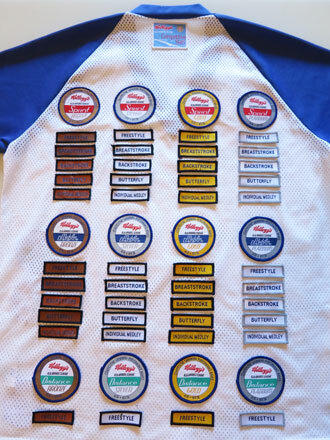 Badges are displayed on the back of the T-Bag in a particular order. Alix/Rachel will be happy to show you the correct format. Times required to achieve these awards can be found on the club notice board on a colour-coded table. All swimmers are issued with a handbook when joining the club this table is included for personal reference along with pages to store your pbs. When you have swum in a gala/open meet a spreadsheet will be displayed on the notice board. This will show the time and the level of award achieved. Style award badges are available for each stroke. The idea here is to encourage swimmers to achieve the correct skills in strokes, turns and finishes. 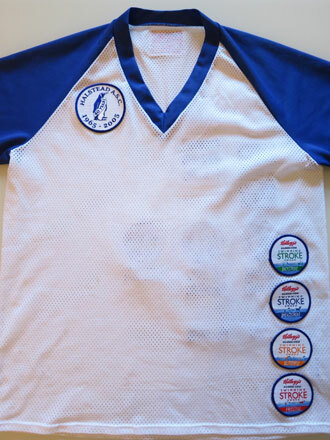 These badges are linked to the style evening of the Club Champs and then awarded during the year at the discretion of the coaches.